As the daylight hours shorten and the air becomes crisper, the lure of the kitchen beckons us to return to cooking indoors for friends and family. If you are looking for new, healthy ideas this fall, the new cookbook, The Yellow Table, is the perfect resource. The Yellow Table is a gorgeous hardcover book with outstanding food photos and creative recipes perfect for entertaining. You will wow friends and family with Anna Watson Carl’s inventive recipes that are not only eye appealing but easy to prepare. Here are two recipes from The Yellow Table. These recipes and more from Carl’s and other new release cookbooks can be found in Healthy Aging® Magazine. In a large sauté pan, heat the olive oil over medium-high heat. Add the garlic and shallots and sauté, stirring occasionally, until fragrant, about 1 minute. Add the tomatoes and sauté, stirring occasionally, until beginning to soften, 3–4 minutes. Add the shrimp, red pepper flakes, and thyme and sauté, stirring occasionally, until the shrimp are completely pink, about 3 minutes. Season to taste with salt and pepper. Add the white wine and bring to a boil. Reduce the heat to low and simmer until the liquid is reduced by half, 2–3 minutes. Taste and season with additional salt and pepper if necessary. 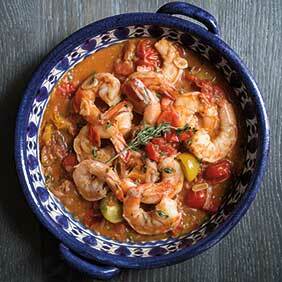 Arrange the shrimp on a warm platter or in a bowl, drizzle with olive oil, and garnish with thyme sprigs. For the Lemon-Parsley Tahini Dip: In a small bowl, stir together the lemon juice and garlic and let sit for 2–3 minutes (this takes a bit of the edge off the raw garlic). Transfer to a food processor, add the parsley and tahini, and pulse until the mixture has the consistency of a thick paste. With the motor running, add the olive oil in a slow, steady stream. Add 2 tablespoons of water and blend until completely smooth. Season to taste with salt and pepper. 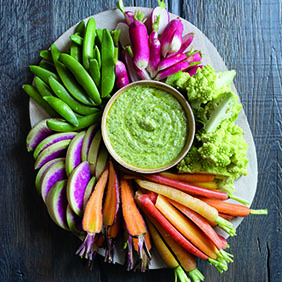 For the Crudités: Arrange the vegetables on a platter and serve with the tahini dip. Variation: To make lemon parsley hummus, add 1 (15-ounce) can of chickpeas, rinsed and drained, to the tahini dip in the food processor and pulse to combine. With the motor running, add 2 more tablespoons olive oil and 2 tablespoons water, and blend until smooth. Season to taste with salt and pepper. Store, in an airtight container in the refrigerator, for up to 3 days. Reprinted with permission from The Yellow Table: A Celebration of Everyday Gatherings, 110 Simple & Seasonal Recipes published in 2015 by Sterling Epicure, an imprint of Sterling Publishing Co., Inc. © Anna Watson Carl.